Diana was murdered by MI6 with military aid and the order came from the palace; I cannot make my views any clearer and I am required to inform you, at the outset, that this book represents my views. But I believe that when you have read the following exposition they will also become yours. Legal advice given was that the words I use should be reduced in passion because to express my true feelings could render me liable to prosecution or make the book unpublishable; so forgive the “economical with the truth”, the constant “in my view”, the “untruths” and the “I believe that” qualifications I was required to include. I know you will read through the chaff and find the heart. Where you accept that the point is proven then that is self-evident but if you question my reasoning please remember that this is my honest opinion; I must state the obvious for legal reasons. I am also required to remind you that an investigation was done by the French police with British police involvement (Operation Paget). But these were, in my view, (I need to keep on saying that) extremely flawed if not downright corrupt and I trust that my reasoning will become very apparent; please rationalise this evidence and take your own stance. If you wish to have detailed information on Operation Paget then be my guest but please don’t write a book about it; I doubt anyone would want to read it, unless they are students of the inane. The inquest detail is more informative because, during this six month period, some men laboured for justice and much of this book’s evidence has been extracted from these inquest transcripts. Essentially, we are dealing with a subject where disclosure of some facts is not welcomed by certain state organisations. For this reason I needed to tread with special care to reveal the truth and to ensure the law cannot be used to silence me. There are, of course other, albeit criminal, means for this purpose at the disposal of those who are permitted to function above the law. But to permit these miscreants their main weapon of controlling the people through fear, is to abandon any hope of achieving democracy. The British nation just continues to use the word democracy and hopes all is well. But refuse to fear them and their days are numbered. As the author of this book I have received several attempts to intimidate me. I have had an unmarked khaki helicopter hover 100 feet above my house in North Wales. I waved; they lingered and then flew off. A friend, who was a serving police officer, noted people climbing up a telegraph pole with line of sight to my house; when he checked the car registration number at the “office” it didn’t exist. I also had a message on my mobile/cell phone when they “Challenged me to pursue my idea”. I travelled by ferry to England from my new home on the Isle of Man and was accompanied both there and on the return by two different sets of “gentlemen” siting one behind me and one to my side. So anyone who thinks MI6 didn’t know where Diana was going needs to reconsider. They abuse people’s liberties without conscience. You will find I have repeated various points several times. This is because you will read a great deal of evidence and I sometimes come across a point where a previous one enhances it. This happens when major points arise and I wish to maximise their value and ensure that you also recall the previous point made, or another aspect of it. To ask that you enjoy reading this book seems inappropriate and I can’t really say that I enjoyed writing it; perhaps, it became more of an obsession. But I do believe that you will become enraged as you read it and, like me, demand justice. This not only applies to the British but all decent people throughout the world; all to whom this story belongs. Remember, Diana was born in England of aristocratic lineage but her maternal grandfather was Irish and her maternal great grandmother, Frances Work, was American and from the State of Michigan (By coincidence a large number of my family settled in the USA generations ago; in the State of Michigan (No particular relevance)). The book was due to be published at the end of August 2012. It was then changed to 1st November 2012. My intended publishers told my agent they were not going ahead with publication, eight weeks before its due release date (It was listed on Amazon for weeks and then declared to be currently unavailable) because their lawyers had told them that the book was “very dangerous”; good, that’s why I wrote it. I always knew disclosure of the truth was going to be dangerous. How could publishers possibly not know (They could have checked before signing the contract)? But at last, after many obstacles, we proceed; I urge that you now deliberate and reach your verdict. God bless! 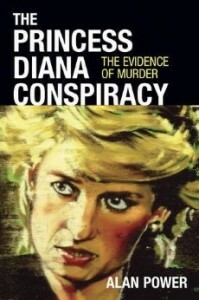 Now to the pursuit of the truth, democracy and Diana Spencer’s victory; even in death.